Theatre director Nam Ron will be presenting two of his previous plays – Lembu and Matderihkolaperlih – as a compilation for his latest production under his own banner Ayaq Hangat Entertainment. Teater Kompilasi Nam Ron Volume 2: Lembu & Matderihkolaperlih will be a 95- minute performance without an interval taking place at Damansara Performing Arts Centre from Dec 24 to 28. Nam Ron is keeping his finger crossed this production will also enjoy the same success as last year’s Teater Kompilasi Nam Ron Volume 1: Laut Lebih Indah DariBulan, which stars Sofia Jane, Sharifah Amani , Vanidah Imran and Aqasha. That production also played to full houses in Singapore early this year. In Volume 2, both Lembu and Matderihkolaperlih have been staged a few times before also to rave reviews. While they have different storylines and settings,they tackle the same themes. “They talk about politics, Malays and gangsterism,” says Nam Ron, who is sharing directing duties with award winning director Ayam Fared on this production. Lembu is about a cow which is to be slaughtered for a kenduri (feast) for a politician visiting a village. When the animal goes missing, everyone is soon pointing fingers at each other. tear apart a society. Society must learn not to let their different political views break them apart. factory worker mum. When he fought off some gangsters who were terrorising the kampung folk, he became like a godfather to the villagers. He then fell in love with a prostitute and have her a brothel to run. But he was soon destroyed by a secret that was revealed. 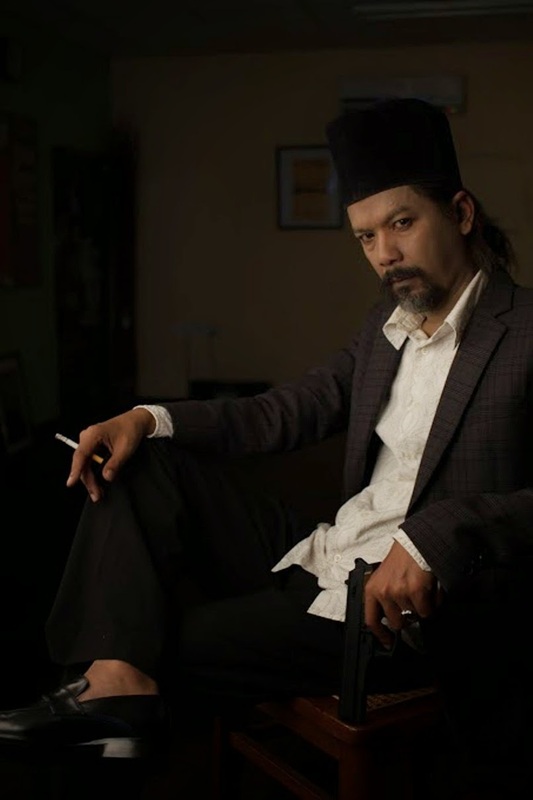 Nam Ron will be playing the part of the politician and is supported by Pekin Ibrahim and actress Sara Ali. He reveals the play came about because he felt he was a “lousy actor”. So, in 2003, he wrote this script as a monologue to break his shynessand force himself to be a better actor.One could say that he has since passed his test.Nam Ron is also not one who puts a lot of importance on the stage sets. “I never over-decorate my stage,” he says. “I want the focus to be on the story, the characters and the performances. “When the set is bare, you are asking the audience to visualise the setting in their mind. No two people will think alike. The set will look different in everyone’s mind. When asked the biggest challenge he faces as a Malaysian theatre artiste, he says: “In the past, it was very difficult to get an audience to watch a theatre play. I have to give free tickets to my performances but I still only managed a small crowd. Nam Ron is already looking to his next project, this time, in films. He is currently writing the script for the second film he will be directing next year called One. Two. Jaga. 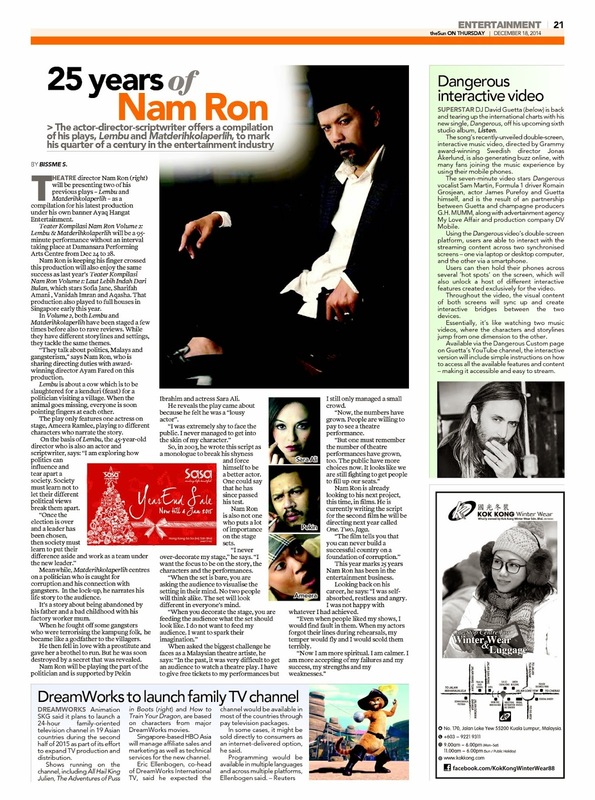 This year marks 25 years Nam Ron has been in the entertainment business. Looking back on his career, he says: “I was self absorbed,restless and angry. I was not happy with whatever I had achieved.